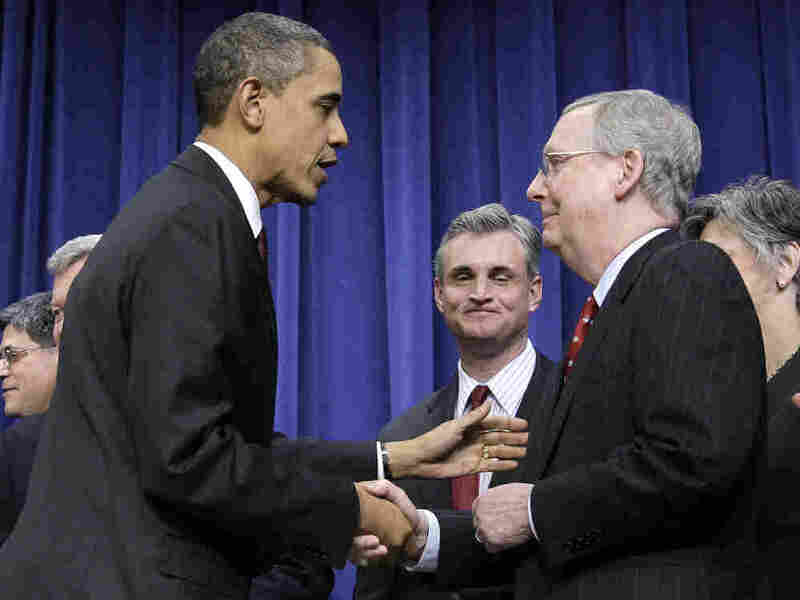 Obama To Meet With Reid, McConnell On Debt : It's All Politics The White House press office announced that President Obama and Vice President Biden will talk with Senate leaders Harry Reid and Mitch McConnell next week in a bid to restart stalled debt-ceiling talks. President Obama with Senate Republican Leader Mitch McConnell after making a tax deal, December 2010. Monday, the President and Vice President will hold meetings at the White House with Senate Majority Leader Harry Reid and with Senate Minority Leader Mitch McConnell to discuss the status of the negotiations to find common ground on a balanced approach to deficit reduction. The meeting with the Majority Leader will take place in the morning and the meeting with the Minority Leader will take place in the early evening. The announcement that the Kentucky Republican is headed to the White House for debt talks next week, follows Thursday's boycott of the debt-ceiling negotiations by Rep. Eric Cantor (R-VA), the House majority leader. Cantor didn't attend a scheduled Thursday meeting led by Biden because, the Republican said, his party's position was that there was nothing left to discuss if Democratic negotiators kept bringing up tax increases. Cantor said he wanted Obama to "resolve" the tax impasse. That "balanced approach" language in the White House statement means Obama intends to talk not just about spending cuts, the Republicans' preferred method to reduce deficits, but what are euphemistically called "revenue enhancers" in Washington — taxes, basically. House Speaker John Boehner (R-OH) has said he understands why Cantor left the talks and agreed that tax increases can't pass in the House so that it's not worth even talking about them. Meanwhile, White House spokesman Jay Carney said Thursday that the talks are pretty much where the president and his aides expected them to be at this point. The most difficult issues that must be negotiated at the highest level, between Obama and Boehner, are the ones that remain, he said. As John Dickerson astutely wrote in Slate, the debt-ceiling negotiations are following the usual Washington script. Both sides talk, then negotiations break down, after which, a lot of angry words are said. Finally, the principals come together to get the best deal they can get in the end. It allows leaders on each side to eventually make the case to their most ideological supporters that they really fought the good fight for their particular party's principles before compromising. The drama in this instance is assisted by the good cop-bad cop routine on both sides. Boehner is the good cop to Cantor's bad. Obama is the good cop to the bad cop of House minority leader Rep. Nancy Pelosi's. Few people in Washington who've seen a number of these negotiations by now expect that policymakers will let the nation default on its debt. Only a minority of policymakers seem to want to run that dangerous experiment. But since Treasury Secretary Tim Geithner set an Aug 2 deadline for when the debt-ceiling must be raised to avoid default, there's relatively a lot of time left for the sides to play out their roles.